We all experience fatigue as a transient phenomenon, particularly during times of physical and emotional stress, and most of us recover full strength, without help, once the affliction has passed. But when fatigue becomes chronic, it can be a distressing and debilitating symptom. To wake in the morning feeling as if you haven’t slept all night, barely able to pull your body out of bed, and having to drag yourself through the day, trying as best you can to perform your basic duties. A normal social life is out of the question. However, you’ve been to your doctor, but with nothing to show for your symptoms, apart from a story which is difficult to communicate, let alone understand. All the tests are normal, and you’ve been told, ‘There’s nothing wrong. Perhaps it’s all in your head!’ But where do you go from here? ‘Try harder!’ they say, supposing that all you need is more motivation. The prod is hurtful. Nevertheless, you try harder, but you still cannot find the elusive energy, which is, by now, only a distant memory. In fact, trying harder makes you feel worse. Some manage to carry on for years, being careful to hide their true state from those around them. Others simply cannot pull themselves through any more. They feel totally drained. Even the most basic personal and domestic tasks seem too much. A few withdraw completely, becoming house-bound, or even bed-bound. Relationships become strained as family and friends strive to understand what they cannot see. In fact, they often think you look just fine! Many who have suffered like this will say that they have lost valuable years; some have lost their jobs, others their marriages, and some, in the pits of despair, have taken their own lives. Stress and depression are reported to be the most common causes of fatigue. For this reason, they will figure prominently in any balanced discussion on the subject. But fatigue has many other explanations, some of which, in spite of being easy to investigate and simple to treat, are seldom considered. Another problem is that some doctors still deny the existence of a chronic fatigue syndrome. Perhaps this explains, at least in part, why patients with fatigue are so quickly and unreasonably dismissed as being ‘depressed’, or ‘stressed’. The brunt of this common practice has been borne by the most severely affected patients. ‘Of course I’m depressed,’ they argue in frustration, ‘It’s because I feel so tired all the time!’ But the cold shoulder remains and the patient turns in desperation to anyone who offers even a glimmer of hope. They are exceedingly vulnerable now and many have spent small fortunes in their quest for relief. Feeling Tired all the Time is an introduction to the common and treatable causes of fatigue. 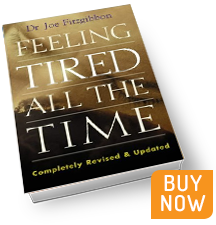 It hopes to provide you with a clear understanding of just why it is you feel so tired, and suggests means by which you can help yourself back towards a normal, healthy, and energetic life. I would be delighted to help you regain your lost energy.